The U.S. Embassy in Japan issued the following statement on Oct. 19. The United States Embassy in Tokyo mourns the loss of Former Ambassador Thomas S. Foley, who died yesterday in Washington, D.C. 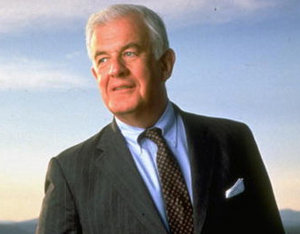 Ambassador Foley was the U.S. ambassador to Tokyo from November 1997 to April 2001. Ambassador Foley served in Tokyo during a critical period. He helped lead the United States’ and Japan’s cooperative efforts in responding to the Asian financial crisis of 1997. In the security sphere, Ambassador Foley oversaw the development of a plan to provide ballistic missile defense systems to Japan. The ambassador also led efforts to respond effectively to renewed provocations from North Korea. Ambassador Foley’s time in Japan capped a lifetime of public service. Prior to being appointed ambassador, he represented Eastern Washington State in Congress for 30 years. He was the speaker of the House of Representatives from 1989-1995. Ambassador Foley and his wife Heather, who survives him, loved Japan. They traveled the country, collected handicrafts, and enjoyed Japan’s great scenic beauty. Most of all, they admired and respected Japan’s people. Those of us who were fortunate to work with Ambassador Foley remember a kind, unassuming, deeply intelligent man who was dedicated to making the world a better place. We send our condolences to Heather and to the rest of his family. We were honored to know this great man. “I am saddened to hear of the passing of Ambassador Thomas Foley. Ambassador Foley has contributed profoundly to enhance relations between Japan and the United States, expand parliamentary exchanges, and to enhance the friendship and goodwill among the peoples of our two countries, consistently throughout his service as the speaker of the House of Representatives and the United States ambassador to Japan.